The Reviver Entertainment Group is proud to announce the signing of multi-instrumental songwriter & producer Alex Kline to its publishing division. Alex served as co-producer on Australian artist Adam Brand’s No. 1 country album Get On Your Feet, and co-wrote Ronnie Dunn’s 2016 hit “Damn Drunk.” A testament to her musical prowess, Alex has also produced for and written with country music stalwarts like Rascal Flatts, Reba, Mason Ramsey, and Bill Anderson. A native of Marin County, California, Alex Kline moved to Nashville in 2008 after attending The Berklee College of Music in Boston. It was in Nashville that Alex found her stride, becoming a founding member of Sony Nashville all-female band The Lunabelles. Over the subsequent years, Alex built up her songwriting and producing chops by working on projects for Mitchell Tenpenny, Terri Clark, Tara Thompson, John King, Maggie Rose, and Jon Langston. 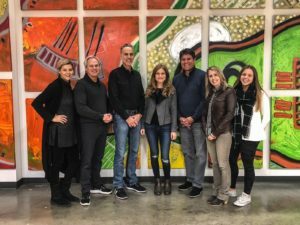 Currently, Kline is also working alongside CMT for their Artist Discovery initiative as a producer for their emerging artists. Founded in 2011 by industry veteran David Ross, The Reviver Entertainment Group, LLC, home of Reviver Records (with offices in Nashville, New Jersey, Phoenix and Pennsylvania), boasts an artist roster that includes No.1 hit-maker/singer-songwriter Michael Tyler, veteran hit-maker and No.1 singer-songwriter David Lee Murphy, rising stars Tenille Arts, Aaron Goodvin, Haley & Michaels, Blackjack Billy, The Carter Family, John Carter Cash, Johnny Cash and the legendary Rock and Roll Hall of Famer (2009) Little Anthony.